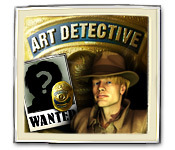 Art Detective is rated 3.6 out of 5 by 13. Rated 5 out of 5 by chinadoll012 from Something Different This is a spot-the-difference game and not HO. The differences can be difficult to spot, such as a variation in shading. I had fun playing this game since it's different from the usual TM and HO. Just don't play for a long period of time as you can probably get crossed-eyed :) It's nice to have something different come across the way. Rated 5 out of 5 by faith5009 from Five Stars for "Art Detective!" I love this, wish it would go on forever. Beautiful classic art selections, mood-creating...What's not to love? A sequel would be wonderful! More art hidden object games, please! Rated 5 out of 5 by nae31950 from this game is awesome Gee, I can't believe that no one has written a review on this game. I played it probably one year ago. If you like finding differences, GIVE IT A TRY..... It is a average challenge to find the differences. I throughly enjoyed this game. Wish there were more like it. Rated 4 out of 5 by AFlowers from A True Spot the Difference Game This is a true spot the difference game. It is not hidden object. I wish BFG had a category for just such games, and that game developers would make more like this. The graphics are not that great, but the game play is! The puzzles go from quite easy to very difficult, and there are plenty of them. I have played hundreds of hidden object games. They used to be fun. But ever since EIPIC started making cookie cutter games, there are very few worth playing. Game developers, please make more spot the difference games. If you are looking for hidden objects, look elsewhere. If you want spot the difference, this is the game for you! 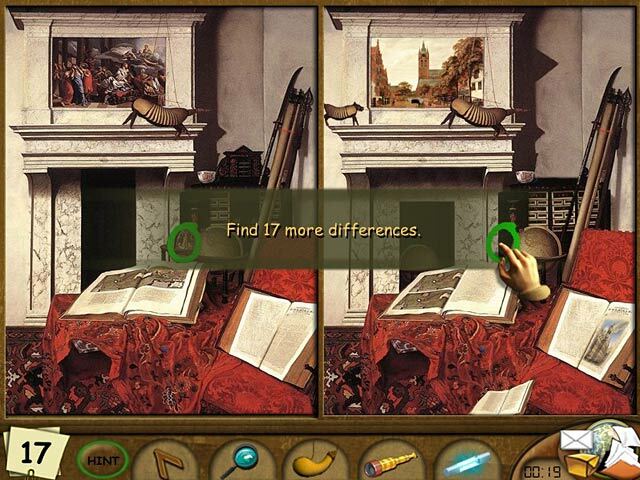 Rated 4 out of 5 by arnold1049 from HEAVY ON "FIND THE DIFFERENCES" This game includes all kinds of puzzles, but the main game play was "find the differences" on pictures of real art. Be prepared for dark, finely detailed pictures and some extremely tiny differences. I'm talking about something the size of a dust mote. 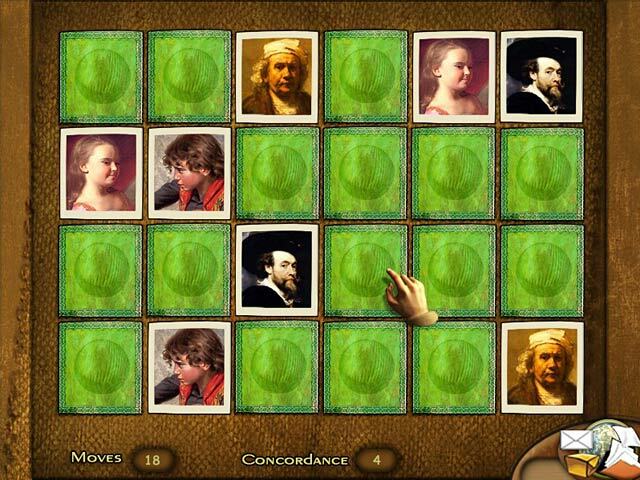 This is a hard game and if your strength is not in "find the differences" this game has the potential to frustrate you. The points earned by completing the pictures can be used to purchase tools to help find the differences. There is a magnifying glass, a telescope, an infra red lamp, dust that can be used to show differences, and other items. The only really helpful tool that I found was the infrared lamp, which cost 5500 points every time you used it on one picture. By the end of the game, I was down to a little over 15,000 points because I had to use this tool so often. There is a hint button, but it recharges very, very slowly.. There are no difficulty levels to choose, so there is no way to change this. The more hints you use, the more wrong clicks you make, and the more time you take to find all the differences, all reduce your score. I had a zero score on several pictures. The harder the puzzle, the more tools you need, but the fewer points you earn make it hard to buy the tools you need. A real catch-22 game. Other puzzles include regular jigsaws, moving jigsaw pieces around to get them in the right place to finish the picture, making matches of cards by turning them over two at a time, finding two of the same mug shots, finding the only mug shot that hasn't got a pair and others. There is not a bonus section per se, but there are places where you can replay all the kinds of puzzles found in the game, as well as more. One area allows you to replay all the "find the differences" pictures. In this same area, you can make a regular jigsaw puzzle out of the pictures found in the game. Another area has 8 jigsaw puzzles, 7 of which you have no point of reference to use to combine the pieces. In other words, there is no picture to show you what the puzzle should look like when finished. The jigsaw puzzles where you have to move the pieces around to create the right picture has no hints and does not tell you when you have correctly placed a piece. You have to keep working at it until you get it right, at which time the game lets you know by removing all the lines around the pieces. To make this particular type of puzzle even harder, the pieces are all the same size and shape. A puzzle game with lots of puzzles, but being good at and liking "find the differences" is a must. Rated 3 out of 5 by pennmom36 from Spot The Difference This is a game that is difficult to navigate through. Basically the main character is working with the FBI to solve a case where art thieves are stealing the original paintings and replacing them with counterfeit paintings. You have to click on your computer to open up your e-mail which will show you a painting of which you click on to spot the fake, or spot several differences between two almost identical paintings. The differences are very noticeable at first but they seem to get a little more difficult as you progress. 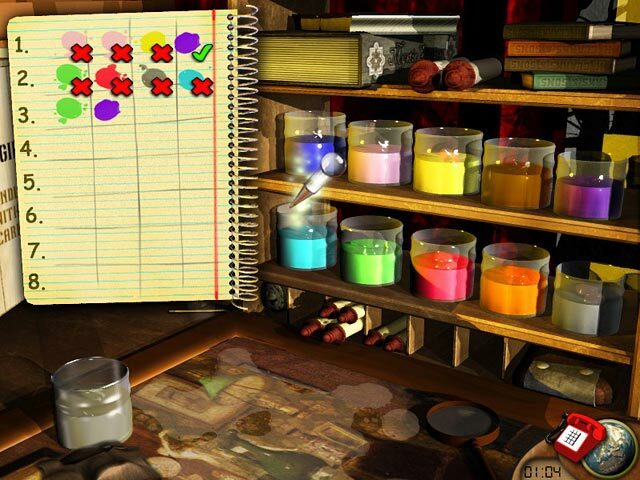 There are mini games such as figuring out what 4 colors of chemicals to mix together by putting different color combinations on a sheet of paper. Once you have all 4 colors on the paper a checkmark will indicate the correct color in the correct spot, a question mark will indicate the correct color but wrong spot and of course an x indicates that color is not used. I really got annoyed by the lady saying you have an e-mail (which sounded like you have emanuelle) over and over. I think the game would have been more fun if the computer wasn't involved in the game. Rated 3 out of 5 by rosekaufmann from LARGE SPOT-THE-DIFFERENCES GAME This is a spot-the-differences game, not a HOG, with a few puzzles thrown in. Nice variety of paintings; details are large enough to clearly see the differences without ruining your eyes. Differences might be minor, such as shading or an extra leaf. Story is not well developed - you investigate paintings for possible fraud and you are notified of these assignments by e-mail. I found it easiest to wait until I finished the paintings I was already working on, before I opened the next e-mail and did not notice any problems with that approach. Those who are spot-the-differences fans might well rate the game higher. THE CONS: Very slow hint refills. Puzzles are nothing new – but they have no instructions. [Actually, nothing has instructions.] You have to find out what the puzzle actually is by hit or miss. Rated 3 out of 5 by amilahani from Interesting I bought it thinking its another HO, but quite surprise to find it a find-a-difference game. Can be quite eye-strain to find the small things. Otherwise, its good. The only reason I give it 3 stars is because its not my type of game. Give it a try if you're into this kinda game.